After staying in Jakarta for three days, with my colleague's help, I have learned to use the city's bus transportation system. I must say that for a city of 8.5 million, their bus transportation system is pretty efficient and I am suitably impressed. Jakarta does not have any sophisticated light rail or monorail transportation system to shout about. But their super efficient bus transportation system seemed to outclass the former. This particular bus transportation system I am referring to is operated by Transjakarta. Dedicated bus lanes criss-crossed the city. These bus lanes are demarcated by low barriers that prevented vehicles other than buses to use the lane. Due to this simple use of barriers, the buses are able to travel their routes extremely efficiently. Passengers do not need to worry if the buses will arrive on time or not. A bus will stop by the bus stop almost every 5-10 minutes. In fact, I dare say that I will get to the destination faster using the bus than a car... LOL. 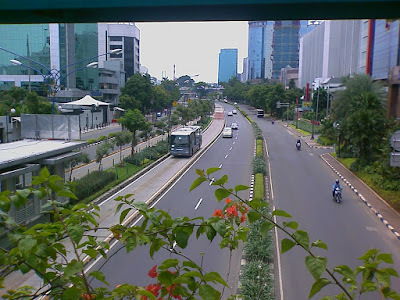 Another unique feature of the Jakarta's bus transportation system is that the bus lanes are located in the middle of the road or highway. Thus, all the bus stops are along the center serving both sides of the road. Personally, I think the city planners in Malaysia have a lot of valuable lessons they can learn from their counter part in Jakarta! 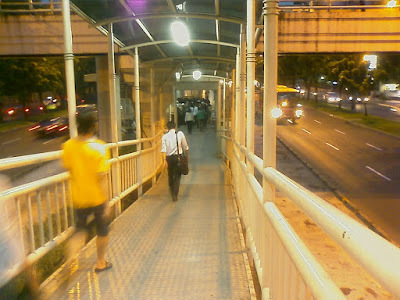 The overhead walkway that led down to the bus stop in between the roads. Walking down to the bus stop. Video showing the arrival at a bus stop during extreme rush hour. Check out the number of people queuing up to board the bus. Left for the Kuala Lumpur LCCT (Low Cost Carrier Terminal) airport at 4:30am this morning. It had been raining the whole month and it was no surprise that this morning it was raining cats and dogs. I was worried about my wife whom had to send me to the airport and then driving back alone in this crappy weather. I was relieved when she called me 40 minutes later and told me that she was back home safely. I decided to eat breakfast at the Asian Kitchen restaurant in LCCT before proceeding to the departure area. Lets just say that I will never ever eat there again. Should have just stuck to McDonalds! Was the AirAsia flight to Jakarta delayed? After getting my luggage, I passed through custom and headed to the Taxi area. A man asked me if I wanted Blue Bird Taxi, and I replied yes. He guided me through the door and wanted me to cross the road to his "taxi". I told the man, I wanted Blue Bird Taxi, and he replied that he was taking me there. My spider sense was tingling and this chap seemed highly suspicious to me. I told him I was not interested in my broken Bahasa Indonesia/Malaysia and went back inside the airport lobby. 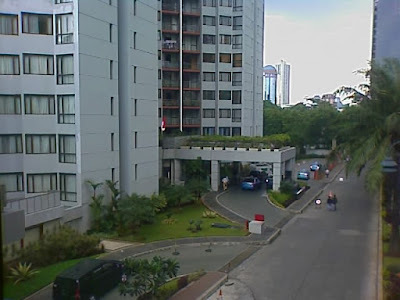 I checked with the airport information counter and they pointed me to the right direction and before I knew it, I arrived at Aston Rasuna Residences through the shortest route (according on my GPS software at least... LOL). Three cheers for Blue Bird Taxi. I was a very satisfied customer!!! Yeah! 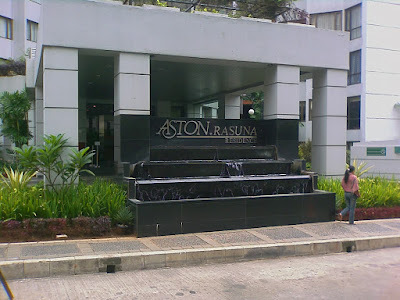 In front of the Aston Rasuna Residence. View of the Aston Rasuna Residence apartments from the Bridge Restaurant. 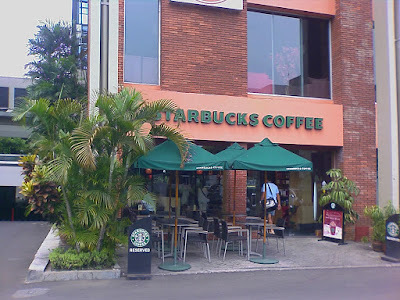 The dissapointing Starbucks at Setiabudi 1 along Jalan Rasuna Said. After registering at Aston Rasuna apartments, I had to wait until 2:00pm before I get the room. So I had about 4 hours to kill. I decided to look for a Starbucks to get online. I learnt a valuable lesson! Not all Starbucks are created equal! I don't know about the rest of the Starbucks in Jakarta, but this one does not have free WiFi coverage. All the available WiFi requires subscriptions. Crap! 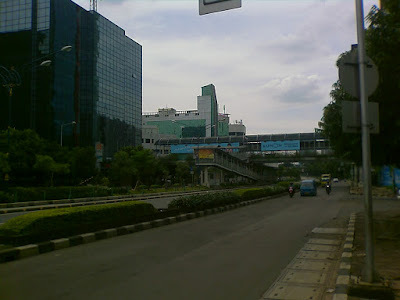 Jalan Rasuna Said, one of the main road of South Jakarta, was almost completely devoid of traffic due to the Hari Raya Haji holiday. 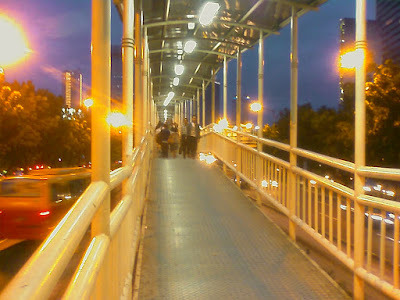 Jalan Rasuna Said from another view, almost devoid of traffic. After about an hour of time wasted there, I decided to walk back to the apartment. On the back, I came across a cultural market of sorts, called Pasar Festival. There was a giant banner saying, "Free Telkom WiFi at the food court". Cool! I thought. So I went in and wasted time finding the food court. This time, I did not break out my notebook, instead, I used my D810 phone and tried connecting to the WiFi there. Again, I could connect to the WiFi but could not access anywhere at all. 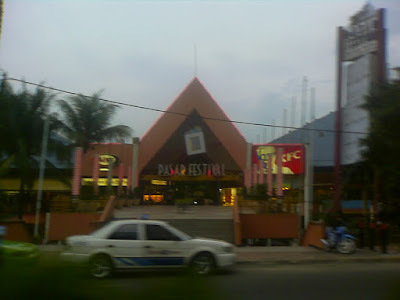 Pasar Festival, where there were supposed to be free WiFi. 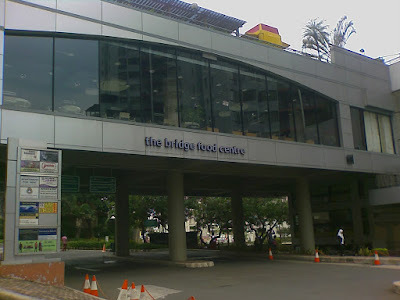 Finally, I made my way back to the apartment entrance, and that was when I noticed across the road, another giant banner stating, "Free WiFi at the Bridge Food Center". I decided to give it one last try. I used my D810 again and this time, I hit the jackpot!!! I was connected and I could surf!!! It was about 12:30 pm. 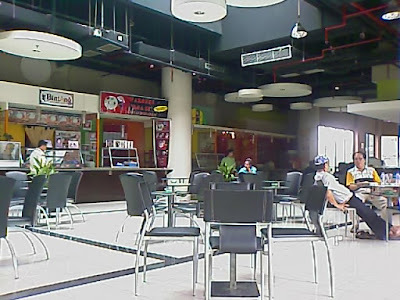 The Bridge Food Center with free WiFi. Inside the Bridge Food Center. And now I am eating my Fried Chicken Rice while updating this blog. Heck, now I am running out of battery power... and the electrical sockets are different. I NEED an power ADAPTER!!! A couple of weeks back, I took the family back to Ipoh for the weekend. 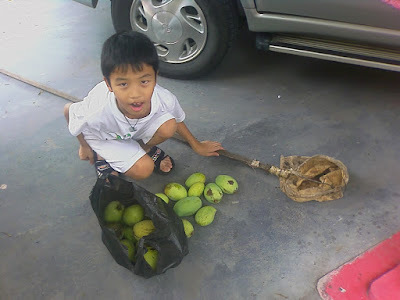 Since my wife's parents have not been staying in their house in Batu Gajah (about a half hour drive from Ipoh), she told me to go there and pluck some mangoes before they all get rotten. Everyone in the family loves mango, whether the mangoes are sweet, sour or even unripe, my wife will find a way to make them into something really tasty. The favourite being sliced mangoes in "rojak" sauce. I took my eight years old son, Joel and we spent the afternoon plucking mangoes from two mango trees planted by my wife's grandma. She passed away a couple of years ago and everyone really misses her, including my kids, whom till today, always refer to Batu Gajah as "Tai-po" place. In the end, we plucked about 30 mangoes. Finally, he spotted some mangoes and managed to pluck one. 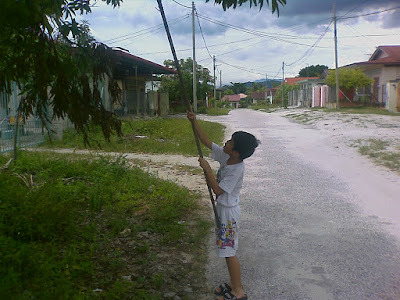 While I was plucking the mangoes with my eldest son, I remembered thinking that, we all get to enjoy these mangoes simply because Tai-po had planted them. At that moment, I asked myself, what will I leave behind for my children when the time comes for me to go? Will it be something as simple and as enjoyable as a mango tree, where every so often they will come by and enjoy the fruits? And perhaps tell stories to one another underneath the shade of the mango tree? I have no answer for myself now, but I think I roughly know, where the spiders are. Will I ever take a vacation in Hanoi again? On Nov 8, I went on a 4 days 3 nights company organised trip to Hanoi and these are my experiences. The 50 plus of us were divided into two teams and sent packing on two different AirAsia flights to Hanoi. The reason for two teams were due to our company risk management policy... that is, in case one plane crashed, at least half of the employees would survive and the company can still go on... LOL. Yeah I know... just so comforting and reassuring to know... LOL. The cool and dry weather in Hanoi was fantastic. It was like walking perpetually in an air-conditioned room... lovely... LOL. After checking in to the Trade Union Hotel, everyone went off in their own groups exploring this city of perpetual NOISE! The noise I am referring to was the sound of vehicle horns. As if the sound of engines and the normal hustling and bustling were not enough, a cacophony of horns of all types filled the air as they assaulted your ear drums. This unwanted symphony will not play itself out until you leave the streets (if you are lucky enough to have a sound-proof room) or the country itself! After staying in Hanoi for 4 days and 3 nights, I could not understand the Vietnamese language even if my life depended on it... but I have come to understand how the drivers communicate with me using their horns. The horns, unlike in Malaysia, were not used out of anger or displeasure. They just wanna announced, "Hey, I am here. Get the f**k out of my way dude! I am coming through and I am not going to stop. So move, move, move..." LOL. One way or another, you will have to take a cab in Hanoi. Just make sure that they are using the meter, said the tour guide. "Baloney" I say! There are discrepancies in the calibration of their meters. Some meters just flies... LOL. I could not see any way around this, unless you wanna walk.... so we were at their mercies. 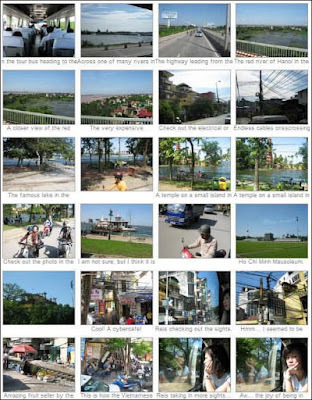 What do I most enjoy in Hanoi? There are a number of things I really enjoyed doing in Hanoi. 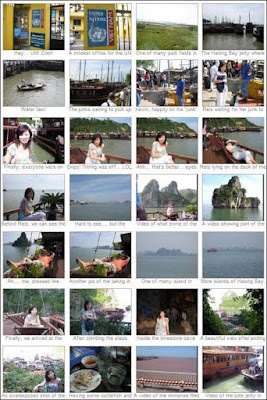 Tour to Halong Bay. Before I made the trip, I was not keen at all to go on the tour. When I heard about the 6 hours bus ride to and fro, and a 4 hours boat ride, I was totally turned off. Thankfully, my wife "convinced" me and I must say that I really enjoyed it. The view was fantastic, but what I most enjoyed was just seating on top of the deck and relaxing in the very cool weather. Walking the streets of Hanoi. Ah... I really liked strolling down the streets on Hanoi, taking in the views and observing the livelihood of the locals. So... will I ever take a vacation in Hanoi again? Submit one(1) photo with the worse composition, lousiest perspective, wackiest angle, clumsiest cropping and fatal framing. Submit one(1) photo with the best composition, sharpest perspective, pleasing angle, artful cropping and amazing framing. 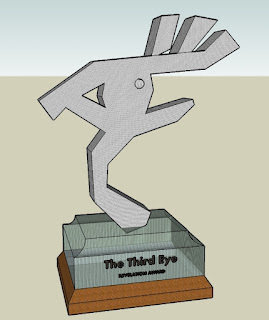 The prize will be a specially made Third Eye Trophy. Using Google's 3D Sketchup software, I managed to come up with a design I liked. After that I proceeded to find out how to get the darn thing made. I asked around and found out that there were just too many options, and all of them very expensive. After mulling over it for more than 6 months, I (finally) decided to go down to my local neighborhood welding shop and asked them if they could help out. Mr. Tan, the proprietor was more than happy to oblige. He had previously supplied and installed the iron grills in my house. So when I asked him to make the trophy, he was more than thrilled to be doing something else other than gates and window grills... LOL. 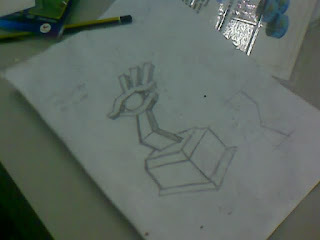 I roughly sketched the trophy out to explain the design to Mr. Tan. 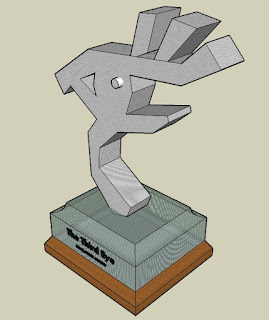 I had not brought nor shown Mr. Tan the original 3D drawings of the trophy. I merely drew the trophy from memory on a piece of paper to explain to him what I had in mind, with intention to later show him the 3D drawings should he decide to take on the job. I think that was a mistake. 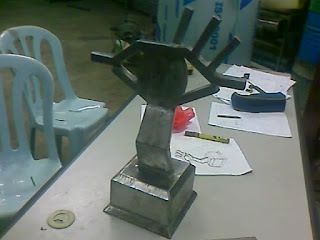 Within 2 days, Mr. Tan called me up and told me that he had completed the prototype of the trophy... LOL. I did not know what to say, as I had not show him the 3D drawings yet. That evening, I went over to the workshop and found the following prototype. It seemed that Mr. Tan got carried away. 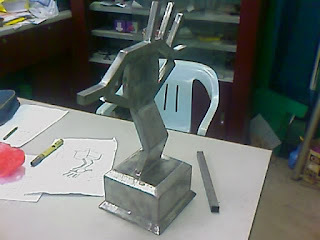 Apparently, that night after I showed him the sketch, he went home and started to make a paper mock-up of the trophy based on my sketch. Even his wife and son got involved... LOL. 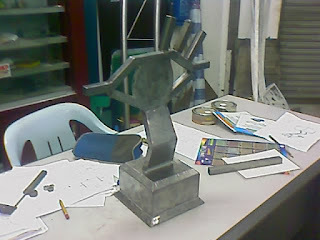 The very next day, he went ahead and started making the trophy without consulting me... LOL. I really do appreciated his enthusiasm, but I was not happy with the outcome. It was far from what I had in mind. In any case, not wanting to hurt his feelings, I gently told him in the Hokkien dialect that the trophy was too "si pan pan" (too square, lacking movement). What I wanted was more dynamic and during that time, I was thinking of how to correct the whole thing. So I told him what I wanted and that he should wait for me to come over to work with him on exacting the changes I had in mind to hopefully correct the form. And so yesterday, I went over and we started making bits and pieces of corrections. 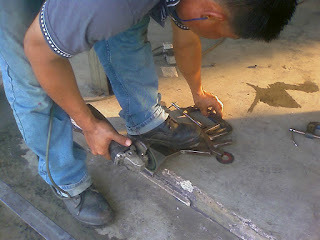 Mr. Tan grinding and cutting parts of the trophy. 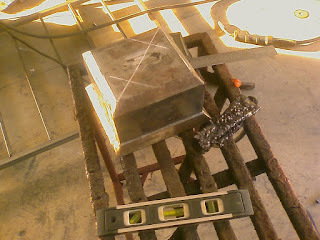 Left over scrapped metal were used to make the trophy. The base of the trophy was very nicely constructed. After making the necessary changes, I think we managed to make the trophy more dynamic... LOL. 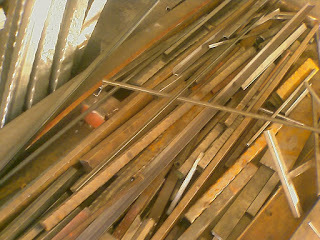 Being a first for me, metal was not an easy medium to work with compared to clay or wood. Anyway, I was quite pleased with the final outcome. 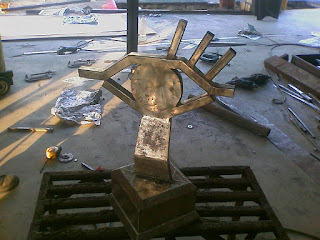 The final Third Eye trophy ready for putty-ing. The following video illustrated some of the necessary adjustments done to the trophy. After the putty-ing, I hope to get the trophy powder coated, but I have no idea where to go and get it done in Kuala Lumpur. I think I will call Sean and ask him... LOL. This article was wrongly published in the Wildgeeks.org blog. I have moved it here, where it belongs. Last night, as the title states, I was having "One of Those Days". An update though, today I have successfully fixed the cooler fridge problem... :-) Looks like it is going to be a great day today... LOL. It is just one of those days that everything seems to go wrong! This morning when I got to office, I could not log in to my Dell notebook. I could only see and move the mouse on a black screen. The day before, I did not shutdown and had only locked my Ubuntu desktop thinking that I could resume work immediately the next day. Using another terminal to log in, I rebooted the notebook. Next thing I knew, it could not start-up as it could not find the boot loader! I got a colleague to help out. He managed to log in and did a "fsck" (file system check) and before we knew what happened, Gnome desktop could not load and the "home" directory went missing! Turns out that my Ubuntu partition went and got corrupted on me. We managed to retrieve almost all of my important files in the "Lost and Found" directory. The complete day was totally wasted! I have not decided what I was gonna do with the notebook yet. Left it till Monday to figure it out. Sigh! When I reach home today, my maid told me that the chiller fridge is acting up. I went to the wet kitchen and heard a terrible screeching sound coming from the chiller fridge! I switched off the fridge and decided to have a look. Turned out that the screeching sound was coming from the cooling fan between the compressor and the condenser. The plastic bracket holding the fan blades to the dynamo broke and the fan blades were hitting the side of the condenser. And without the fan, the compressor and condenser would over heat... sigh! The chiller fridge with all the fruits and vegetables removed. After dismantling the sliding brackets, I managed to slide the compressors out. I removed the whole fan bewteen the compressor and the condenser. Another view of the fan. The electrical power source in the fridge. The condenser with the fan removed. Tomorrow was supposed to be my day of cycling with the guys. But now it looked like I have to spend the morning hunting for fan parts before the shops close at noon! Darn it! Just when I published this post, I realised that I posted in the WRONG blog!! Niah mah!!!! What a jinxed day! After Joel has successfully learned to ride a bicycle using the gliding method, I decided to get Jordan to learn to ride as well. But first, I had to find a bicycle that fit this 6 years old's size. For his age, he was extremely small in stature... LOL. His 4 years old sister was almost the same height as him. I told Joe (my colleague) about my success in teaching Joel to ride and my predicament of getting a bike small enough or Jordan. Joe said that he had a small bike at home and that Jordan could have it. That evening, I went to Joe's house in Sri Petaling and picked up the bike. After I reached home, I immediately started dismantling the trainer wheels and the pedals. Unfortunately, that night my wife had to work late and they arrived home late at about 8:00 pm. In any case, I got Jordan to try out the bike. I taught him to push the bike with both of his feet and then try to glide on the bike with the forward momentum. He spent about an hour doing that until his mother started to make noise... LOL. The next night, Jordan started to glide a fair distance with one push. When he went on a downhill slope, he could glide all the way down. Success! Pedaling would be the next milestone. The next day, Saturday, I managed to get my kids home around 4:30 pm. After their customary nap, Joel and Jordan were pestering me to let them go out and ride. Early that morning, I had gone on a cycling hash to the trails in The Rubber Research Institute between Subang and Sungai Buloh. Together with Joe and the rest of the Wildgeeks, we had a great a hash! But I was a quite tired. Anyway, by 7:00 pm, Jordan was pedaling like there was no tomorrow. His elder brother, Joel, was quite encouraging. Jordan on the "new" bike. Joel and Jordan on their bikes. Joel was over confident. He skidded on the sand and fell down. Joel's little injury on his knee. Jordan, Jodene and Joel with a damaged pride... LOL. Jordan pedals for the first time. Jordan confidently pedaling down the slope with the brother coaching him. And now, my 4 years old daughter has started pestering me to teach her. Unfortunately, this Sunday evening has started raining and I could not take them out cycling. Lets see what tomorrow brings... LOL. Next weekend, I will get their elder sister to take them cycling. Finally, Joel Learned to Ride a Bicycle! 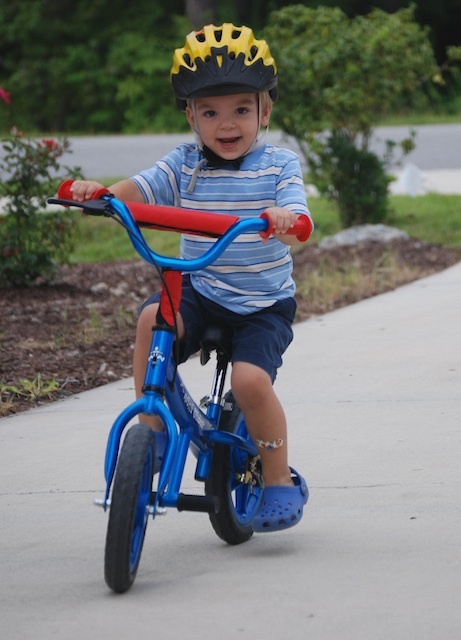 After my last blog post, "Its not a Bike, It's Like a Bike," I have been wanting to get Joel to learn to ride a bicycle using the same "pedal-less" method. Notice that the bike's pedal had been removed. So today, I removed the training wheels and the pedals on Joel's bike. Then I told him to use both his legs to push the bike forward. 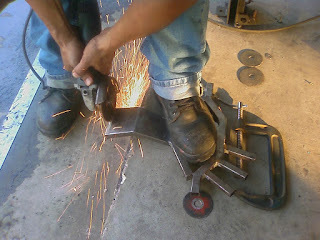 As the bike moves forward, I told him to lift up his legs and roll forward on the momentum. Within 2 tries, he managed to roll his bike downhill without using his feet to touch the ground! The next challenge was to get him to move forward by pedaling. And so, I installed back the pedals and got him pedaling within the first try! Like any father seeing his child learn to do something for the first time, I was very proud of him. Jordan and Jodene standing by their elder brother. I got him to give this confident pose... LOL. A video of Joel rolling down the hill on his bike. And now Jordan and Jodene are bugging me to get them a small size bike so that they can learn as well... and it is no surprise that Joel is looking forward to riding his bike tomorrow. I was browsing the blog-sphere when I saw the Google advertisement saying, "LIKEaBIKE". I was thinking, "What do you mean like a bike? Is it a bike or not?" I was curious and so I followed the link. According to the website, "The LIKEaBIKE is a unique toy vehicle for children between the ages of two and five. Riding a LIKEaBIKE is incredible fun for kids! At the same time, it's highly beneficial for the development of their motor skills and sense of balance." I have been trying to teach my 8 years old to ride his bike to no avail. I think this LIKEaBIKE will definitely help him to attain his balancing skills. Check out this 2 years old on the LIKEaBIKE! As usual, I started "googling" for similar balancing or gliding bikes and found this cool alternative called PVGlider. A 1 and a half year old riding a bike! I will update the results here later... LOL. An old friend from Vancouver, Canada came and visited with his family. I had not seen him for almost 13 years. So it was great to be able to catch up with him. My wife and kids seemed to take an instant liking to my friend's family. I guess being of the Hakka dialect helps. Immediately after they met for the first time, they started conversing in Hakka like long lost friends... LOL. I wish I had more time to take them around. So many food to try and places to explore... LOL. I had only managed to take them to Seremban to try out the Hakka noodles at the Wet Market and then a drive down to Melaka to try out the Hainan Chicken with rice balls, durian chendol and satay. Of course, they had to conduct the obligatory walk down Jonker Street. We were only in Melaka during the day and hence, did not have the chance to let them savor the fantastic night cuisine. 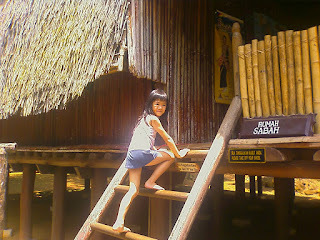 I did manage to get them to visit one tourist spot though... Mini Malaysia, where they explored the many different Kampung stilt houses. On their own, they had visited most parts of KL earlier... so the customary shopping requirement had been fulfilled. Jordan, Brandon, Joel Jodene and Isabell in front of my house. Jodene, Jordan, Reis, Joel and Jessie. 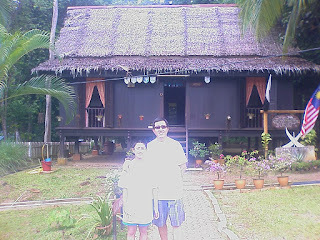 David and Brandon in front of a Kampung house in Mini Malaysia in Melaka. Isabell climbing up to a Khadazan bamboo house. 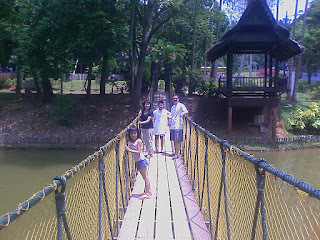 Isabell, Jessie, Brandon and David on the suspension bridge in Mini Malaysia. On Saturday, David and his family left for Hong Kong. Just before that, I managed to squeeze in a detour to Nilai 3 for a quick shopping break... LOL. They will spend a week in Hong Kong before leaving for Vancouver. I hope I get to see them in 2 years, as we had agreed to go vacationing in Thailand or China together with some other friends.